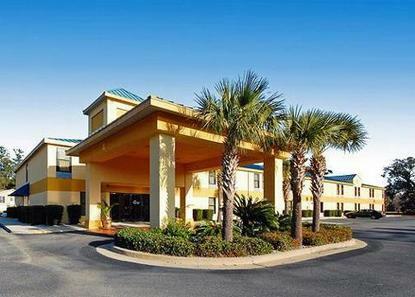 Hotel located adjacent to Georgia Islands Factory Shoppes with easy access off I-95. Several restaurants within walking distance. All rooms feature free wireless high- speed Internet, microwave, refrigerator, iron/board, coffee maker and hair dryer. Free deluxe continental breakfast. Historic Darien offers tours of Fort King George and beautiful old hanging oak trees which are throughout the area. Sapelo Island, Brunswick, St. Simons Island and Jekyll Island are within a short drive. Shop the outlet mall, try the local seafood restaurants and enjoy the Southern hospitality. Pet charge of 10.00/night, limit two pets per room. One adult 21 years and older in each room. No local residents within a 25 mile radius.